Rhabdomyosarcoma is a type of cancer that most often begins in the soft tissues of the body including tendons, muscles, nerves, fatty tissue and fibrous tissue. Although rhabdomyosarcoma only accounts for a small percentage of all childhood cancers, it is the most common sarcoma arising from soft tissues. It usually affects children and young adults between the ages of 2 and 25 and is slightly more common in males than females. The two most common forms of rhabdomyosarcoma are called "alveolar rhabdomyosarcoma" and "embryonal rhabdomyosarcoma." These two forms appear slightly different under a pathologist’s microscope; both are highly malignant and can metastasize (spread) rapidly to other areas of the body including the bone marrow, liver and lungs. Accurate diagnosis and staging, and prompt, carefully orchestrated therapy are particularly critical when treating rhabdomyosarcoma. 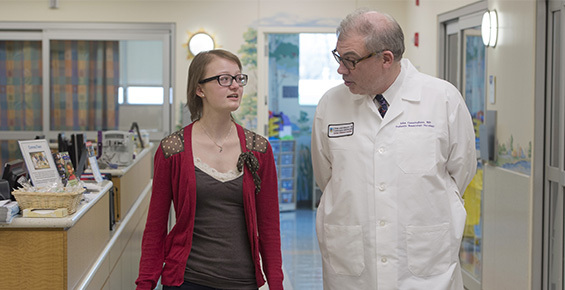 The University of Chicago Medicine Comer Children’s Hospital has a multidisciplinary team of experts with the experience and advanced resources to diagnose, analyze and treat rhabdomyosarcoma and other soft tissue sarcomas. Pediatric oncologists, radiation oncologists, surgical oncologists, pathologists, nurse specialists and others at Comer Children’s work together to strive for the best results for children with bone sarcomas. These symptoms may resemble other conditions or medical problems seen in children and young adults. Always consult a physician for a diagnosis. Ultrasound is sometimes used in addition to CT or MRI to identify the location of a tumor within the abdomen or within a muscle. Biopsy removes a small amount of the soft tissue tumor for microscopic examination by an expert pathologist. Because rhabdomyosarcoma can also spread to the bone marrow, a sample of bone marrow is also collected as part of the staging process. Lumbar puncture/spinal tap removes a small amount of cerebral spinal fluid for microscopic evaluation. This test is only needed if it appears that the rhabdomyosarcoma has extended into the brain or spinal cord. Using extensive, specialized testing of the tissue — often including molecular tests for genetic abnormalities within the rhabdomyosarcoma cells — the pathologist is able to confirm the diagnosis and identify the type of sarcoma. The sarcoma team then assigns the tumor a stage number (1 - 4) and a group number (also 1 - 4). Both numbers define whether the tumor is localized to only one site or has spread to other sites, and how much (if any) has been removed by biopsy. Having the correct diagnosis and stage/group assignment is critical for optimal treatment planning. Treatment for rhabdomyosarcomas requires several levels of therapy. Often, treatment includes surgery to remove some or all of the tumor that is visible, combined with chemotherapy and/or radiation therapy to attack microscopic tumor cells that have spread to other sites in the body. In rare cases, treatment may include a stem cell (or bone marrow) transplant. Treatment plans are tailored to the needs of each patient and vary depending on the stage and group numbers for the cancer. Surgery to remove the cancer and a margin of healthy tissue surrounding it. If the tumor is in an arm or leg, it is sometimes (but rarely) necessary to remove all or part of the limb. Radiation therapy can be given before surgery to shrink the tumor or after surgery to kill any remaining cancer cells. Chemotherapy can be given to shrink the tumor and make it more accessible for surgery or radiation therapy, or both. It is also used after surgery to eliminate microscopic tumor cells that remain in the body. Stem cell transplant is sometimes recommended for patients with the highest risk disease. In this case, the use of a transplant allows even higher doses of chemotherapy to be given. Some patients may be eligible for studies of the very newest therapies through clinical trials being conducted at Comer Children's. Parents are closely involved in deciding whether or not to enroll their child in a clinical trial. Clinical trials are only considered by the sarcoma team if they are thought to provide the best chance to cure the rhabdomyosarcoma. Like most tumors of childhood, the cause of rhabdomyosarcoma is not completely understood. Scientists believe that rhabdomyosarcoma tumors begin in primitive cells that normally turn into muscle cells. The tumor, which most often appears in early childhood, can occur essentially anywhere in the body. What are the risk factors for rhabdomyosarcoma? Only in rare cases do children appear to inherit an increased risk for getting rhabdomyosarcoma as part of a genetic syndrome. Most of the time, there is no identifiable risk factor. Do I have to worry that my other children will get rhabdomyosarcoma? It’s rare for other family members to be affected. We always analyze family history for each new patient. Occasionally a genetic problem is suspected. In that case and if desired, the patient and family members have the opportunity to be evaluated in our Pediatric Familial Cancer Center to try to understand possible inherited risks that might predispose them to rhabdomyosarcoma or other cancers. What does the stage of tumor mean? Once the diagnosis has been confirmed, your oncologist will assign a stage to the rhabdomyosarcoma. Staging for rhabdomyosarcoma is complex and depends on the location of the primary tumor, the size of the tumor, the involvement of nearby tissues, whether lymph nodes are involved and if the cancer has spread to distant parts of the body. Rhabdomyosarcomas are also given a group number. The group number takes into account how much of the primary tumor has been removed and if the rhabdomyosarcoma cells have spread. Where does rhabdomyosarcoma usually spread? If the tumor cells have metastasized (spread), they can be found in a wide variety of locations in the body, including the lungs, brain, breast, bones, bone marrow, liver, lymph nodes, spleen and other soft tissue sites. Rhabdomyosarcoma may require surgery for the initial biopsy, removal of all tumor tissue in the primary location and (sometimes) resection in areas where it has spread. Sometimes the tumor is removed after treatment with chemotherapy and/or radiation. In some cases, the tumor cannot be removed. In these rare cases, it is treated with radiation and chemotherapy. Will my child need chemotherapy? If so, how is it given? Chemotherapy, before and after surgery, is a critical part of the comprehensive and multidimensional treatment of rhabdomyosarcoma. It is sometimes given before surgery in order to shrink the tumor, which can make surgical removal easier to accomplish. Chemotherapy is also given after surgery, even if there is no other evidence of tumor left behind. This is done because we know that microscope amounts of rhabdomyosarcoma remain after surgery. Chemotherapy is used to eradicate these cells to minimize the chance that the cancer will come back at other sites. Chemotherapy for rhabdomyosarcoma is nearly always given intravenously (IV) through a catheter called a "central line." It is usually given over a period of two to five days in the hospital. Each of these “cycles” of chemotherapy is given every two to three weeks. Usually, about 14 cycles of chemotherapy are used. Will my child need radiation treatment? Radiation is often given to sites where the rhabdomyosarcoma is visible. In situations where surgery cannot be used, radiation treatments can effectively control the tumor and prevent the cancer from growing. In some cases, radiation therapy is used after a primary tumor is removed in an effort to get rid of any cancer cells that might have been on the “margin” or edge of the tumor removal site. How long will treatment take? How long will my child be in the hospital? Chemotherapy for rhabdomyosarcoma is usually given in cycles, with each cycle covering a period of 2 to 5 days in the hospital. A new cycle is given approximately every three weeks. For most of the time between cycles, patients only return to clinic for a check-up once per week. The number of cycles varies, depending on the stage and group number; the total duration of chemotherapy can be from 12 to 45 weeks. At some stage before or during the treatment, surgery is often performed to remove the visible tumor. The recovery period in the hospital varies from patient to patient, lasting from several days to one to two weeks. Radiation therapy, if needed, is given five days per week for four to six weeks. It is administered in the outpatient treatment center. Chemotherapy is often modified or delayed during surgery or radiation therapy. Chemotherapy drugs not only attack the cancer cells, they can injure normal tissue and blood-forming cells. For this reason, your child may experience some of the common side effects of chemotherapy including low blood counts (causing anemia), nausea, vomiting, hair loss, mouth sores, irregular periods (girls) and inability to produce sperm (boys). Radiation therapy may put children at a risk of developing a second malignant tumor later in life. 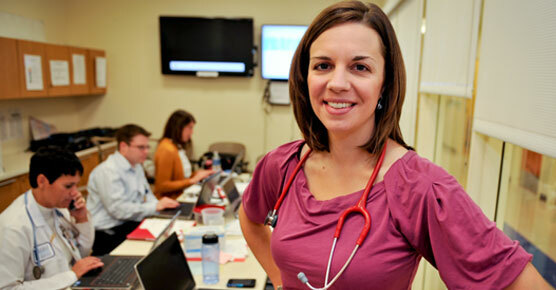 Your treatment team will do everything they can to reduce or prevent side effects of treatment. Patients and their parents should talk to their doctor about the reproductive risks associated with cancer treatment. In certain situations, there are options available to try to preserve fertility, such as with sperm banking. These programs are available at Comer Children’s. What is the prognosis for survival? The prognosis for survival varies widely depending on the stage and group of the rhabdomyosarcoma as well as the type of treatment used. The survival rate for rhabdomyosarcoma patients who undergo chemotherapy and surgery, and who have no metastases, is more than 80 percent. Historically, survival rates for patients who have metastases are approximately 30 percent. Unfortunately, rhabdomyosarcoma can return after treatment. It can come back at the original site or at virtually any other site in the body. Additional surgery, radiation and chemotherapy or other experimental therapy can be used.